We’ve just completed a custom built mini power station for a local group who want to harness their energy from pedaling by converting 12v DC to a more useful 230v AC. 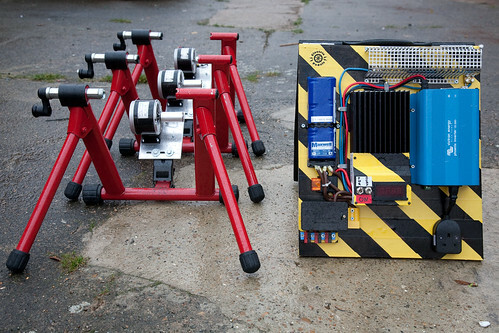 Using our Bicycle Generators, they can run their own pedal-powered concert or cinema anywhere as this system is completely off-grid; in fact they’ll be able to power whatever their creative minds can imagine! The bicycle-substation brings a whole new dimension to events, encouraging people to be more than just an onlooker, but to interact and becoming part of the event. Five people pedalling can easily deliver a constant 200watts of clean AC power with peaks of up to 300watts. This is easily enough to get people up and dancing and celebrating free clean energy. The bicycle-substation can also be used for educational purposes. The simple layout allows onlookers a brief introduction to micro generation and renewable.